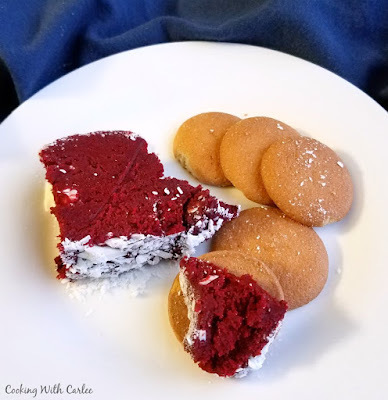 Luscious red velvet cake and cream cheese frosting flavors come together for a one of a kind dessert experience. 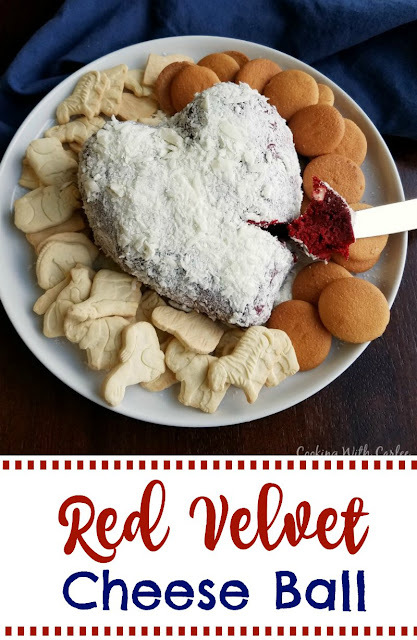 Red velvet cheese balls are perfect for Valentine's Day, Christmas or just because! Red velvet is everywhere... and Valentine's day is coming up, so that only accelerates the red velvet madness. Add to that the cheese ball resurgence and it's a perfect storm. I have to say it's a storm I can totally get behind too! Cheese balls are easily adaptable for any taste or occasion. 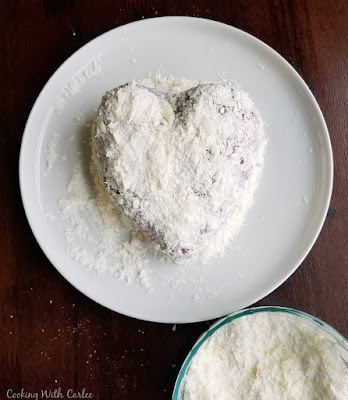 So why not do a make a dessert cheese ball that's perfect for Valentine's Day (or Christmas, or just because!)? This is easy to make, and has that wow factor. It would be great on a buffet at a party. In fact it has been very well received on multiple spreads at our house! Everyone can take as much or as little as they like and other than putting it out and assembling some dippers, it doesn't take any last minute work. It can be made ahead of time and doesn't involve much mess. It would be a show stopper at a potluck or fun for a picnic. And just think of all of the fun dippers you can use. We love vanilla wafers, animal crackers, graham crackers and even pretzels. I'm sure it would be great on chocolate sandwich cookies as well! If you like red velvet inspired recipes, you'll have to check out my red velvet puppy chow. Or maybe all this talk has you craving cake. If that's the case, scratch that itch with a lemon velvet cake with lemon sweetened condensed milk frosting. It's so good! 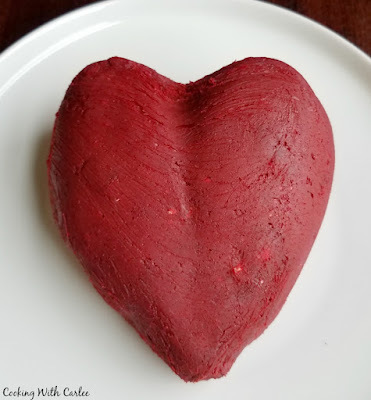 Valentines inspired treats can be so much fun. If you'd rather have your red velvet in cupcake form, check out these 5 ingredient red velvet cupcakes. The 5 ingredients gets you both the cake and the frosting! Maybe you would rather have cookies. 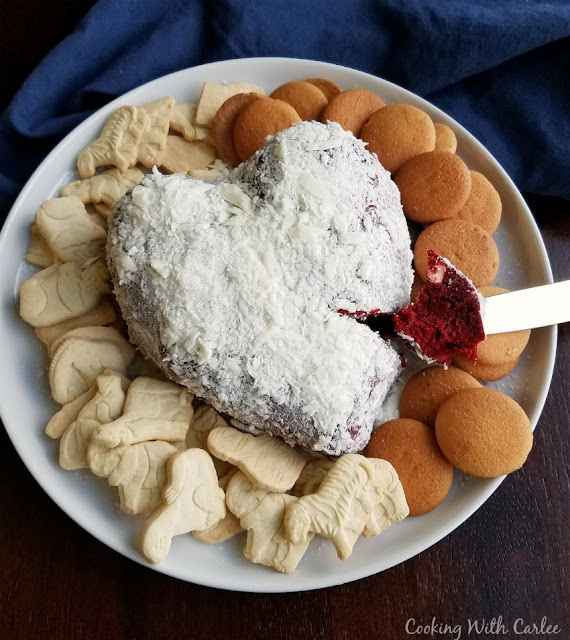 These vanilla bean cookies are super cute and the chocolate hearts make them adorable for Valentine's day. I have a peanut butter heart blossoms recipe as well! If you are watching your carbs, my friend Grumpy's Honeybunch has a fun chocolate mayo cake that is sized for two and keto friendly! But whatever else you make to celebrate Valentine's Day, be sure to have this cheese ball on your menu. It is sure to get their hearts beating and their sweet teeth happy. Plus is is so fun to make and eat, it's just a winner all the way around! Have you ever made a sweet cheese ball? What's your favorite flavor? Mix together cream cheese, butter, sugar and cake mix. Form into a ball (or heart! ), wrap tightly in plastic wrap and chill for at least an hour. Roll ball in chocolate chips or press with chocolate shavings before serving. Wow! This sounds so decadent! Stopping by from Sweet and Savoury link up and pinning to Pinterest. It is, and so good! My little guy just wanted to pick the white chips off the outside though! That is exactly what my little guy did! Which is fine... more cheese ball for me! Thanks for hosting! Thanks for hosting! The cheeseball was delicious! Wow, Carlee, this is a little over the top, lol! I can only imagine! :) Are those Nilla Wafers? I bet they'd be perfect! Isn't it though? It was delicious anyway! They are Nilla Wafers, which were my favorite dipper but graham crackers and pretzels were good too. I literally LOVED this so much that I am including it this Friday on my Friday Favorites Hearts Edition!! Soooo beautiful and yummy looking and the way to my family's heart!! Thank you so much, Andrea! You are the sweetest! Hi Carlee, I have never tasted any sort of cheese ball! I know I haven't lived. I don't think I'd ever heard of them until I started reading your blog. Red velvet cake mix isn't something we get here either. I do live on a rock!... Now lemons are something we have an abundance of. You definitely need to come spend a month with us and we'll just eat our way through the grocery store! ;-) Then I'll have to go home with you so we can walk off the weight we gain! Beautiful Valentine's treat! Thanks for sharing at the What's for Dinner party! Have an awesome week. Thanks for the reminder, Carole! This is really cool- It would be a great thing to bring to a a potluck for a little red-surprise! Um no I've never made a sweet cheese ball but THAT'S about to change! Thanks for linking up to the Friday Frenzy--we appreciate you! You totally should! We have a few varieties that we really love and I'm sure you will too! 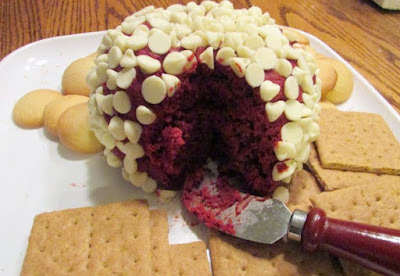 Your Red Velvet Cheese Ball is so special, I pinned it! Hope you are having a great day and thanks so much for sharing your awesome post with us at Full Plate Thursday. This sounds so good! I know I would love it, but do you have to share?? Nope, hide it and keep it for yourself. I won't tell a soul! What a great idea! I'm glad that you put the powdered sugar on the heart - it was looking a little too real for me! I also love the white chocolate chips on it. Ha! I like the contrast of the white and the red too!